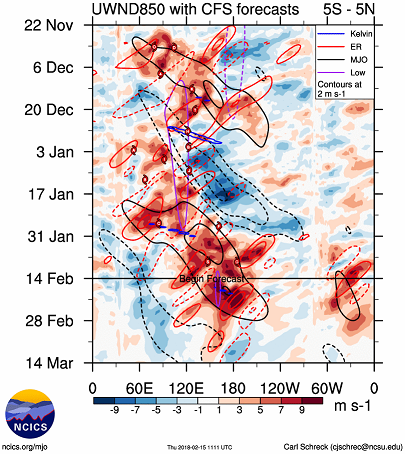 MJO 6/7 is West Pacific and there is currently plenty of cloud in West Pacific. 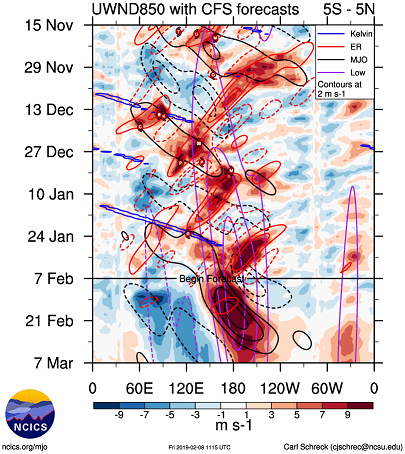 Cloudiness and westerly anomalies in West Pacific continue to be at similar levels to the 06/07 weak el nino event, and more extensive than previous warm neutral events such as 14/15. Ta Mike. I did think that phase 8 was at the E boundary of Nino.3 (have now marked the zones on my globe). 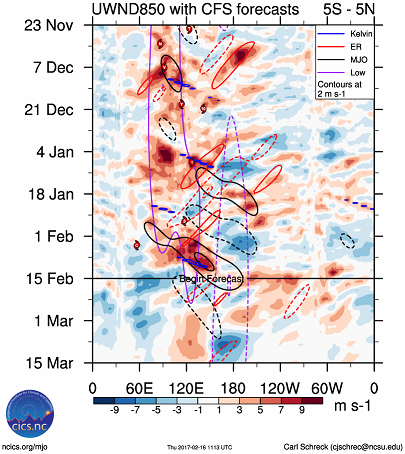 The present cloudiness at 6/7 has been persistent for many weeks there, despite the MJO location. Cloud there, imo, is typical of neutral enso. That WWB on CFS looks like a whopper if it comes to fruition. 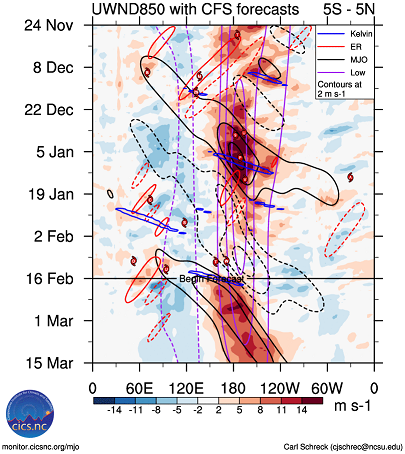 The far east side of Nino3.4 (130-120W) looks to be cooling on todays readings. The below SST profile has also cooled out that way over past week. what are the perils we face??? post 1489503 -- the numbers end with 10! Make them end with 10, not one !!!!! it's not the MJO! Gfs extended has onshore surface winds but 700hpa will be SW. Looking at latest GFS run this arvo, .....looks dry in the 8 day outlook for most in Aus. Perhaps opportunity will be mopped up by the large prognosed tropical storm in the Coral Sea (but far offshore) set to move slowly E? Referring to SAM effects on east coast. Umm yeah that’s why it’s dry. The SAM is literally dropping off a cliff, also worst possible time for it when we rely on the Monsoonal moisture dropping South with highs sitting south of the continent. Forecast WWB according to GFS next week is pretty extreme. Wait and see if it happens, and if it does we should be well on the way to a strong el nino. Got that "its about to swing one way, ....or another" feeling in my gut as well Mike. Knife edge alright. If we were in June I'd be getting on a Nino, but we barely into February so I know better. Perfect conditions for that hated Quidge. So what is driving the short term climate response now? ENSO appears atypical. Different labels put on ENSO scenarios, and status, but we're in the season where ENSO is commonly uncertain. MJO a measure that is probably more a response indicator than driving indicator. IOD and SAM other indicators not alone but potentially also related in the bigger picture. Seems that a lot is still estimating or guess without much sound basis. So much we don't yet know. I'd call it climatic indecision. With ENSO neutral, for the southern hemisphere (only), it seems that Huey is happy with the heat balance between the equator and the south pole (probably influenced by the massive tongue of warm water extending SE'ward all the way to 100W/30S in the southern Pacific). SAM going neg = strong westerly winds. 6 registered (snowbooby, Mike Hauber, Multiversity, Weary, 2 invisible), 59 Guests and 1 Spider online.